We are honoured to have been asked again to host the now legendary annual CamSight “Dining in the Dark” fundraiser. 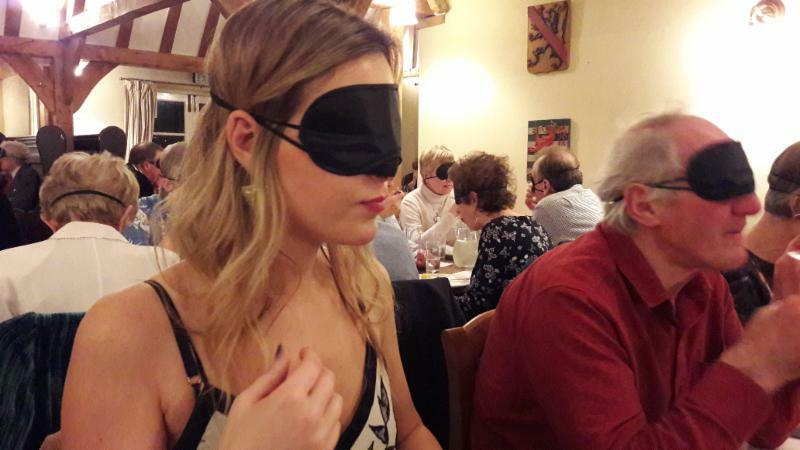 This is a unique event in the Cambridgeshire social calendar where guests are challenged to identify key flavours in their starter and pudding taster plates, while blindfolded. It might sound easy, but each year we have to persuade the chefs not to try to be too clever as it is surprisingly difficult. Main courses are chosen off the menu on the night and enjoyed without blindfold. Always great fun and a sell out. With the help of sponsorship from Adnams Wines, we donate 50% of all food and drink sales on the night direct to CamSight, so typically raising about £1000 for this worthy and longstanding local charity for the visually challenged. Tickets are £45 to include all three courses (main course selection here) and gratuity. Do book a table to join the fun: Nick Burr at Camsight.